It’s not unusual for a newly hired broadcast executive to arrive in a market and proclaim that he or she will take down the existing ratings champ. At least not here in Philly. Multiple times over the past three decades or so, I’ve written about TV honchos coming to town vowing to replace 6ABC as the market’s most-watched news outlet. As you may know, that never happened (although, according to the November 2017 Neilsen Ratings, NBC10 is giving perennial powerhouse 6ABC a run for its money, at least among the all-important 25-54 demographic). But Eric Johnson, who late last year was installed as program director at WPEN-FM (97.5)--which markets itself as “97.5 The Fanatic”—is taking a different, far more collegial tack. The Fanatic perennially has viewed rival WIP-FM (94.1), the region’s jock-talk behemoth from afar, in terms of the Neilsen ratings, which track radio listenership. But rather than seek to wipe out WIP, Johnson believes there is room at the top for both stations. (Full disclosure: My weekly radio show, also called “That’s Show Biz,” airs on WWDB-AM (860) which, like The Fanatic, is owned by Beasley Media Group LLC. However, I receive no compensation from the company). According to Johnson, while strong ratings are always the name of the game, he’s more concerned right now with getting his ducks in a row before making a move toward the upper reaches of the ratings chart. 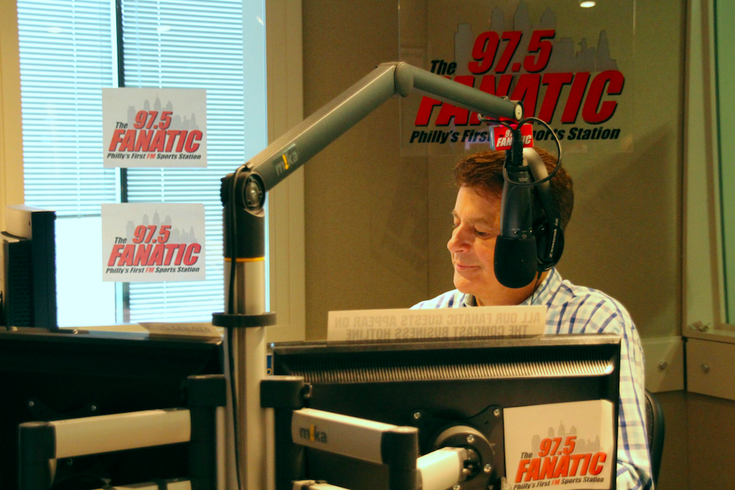 “My main priority for The Fanatic right now is just making sure the station is playing to the short attention spans out there,” he said. So far, Johnson is happy with the team he’s leading into battle. “We've got some great hosts on the air,” he offered. “We have Mike Missanelli in the afternoon, who dominates [in the men 25-54 category], and our other shows are increasing in the ratings. While The Fanatic is the subject of Johnson’s initial focus, it will be interesting to watch the progress of The Fanatic’s AM-band sister, WTEL-AM (610), which is dubbed “610 Sports.” Currently, the station—which occupies WIP’s original dial setting--primarily offers national programming, including some supplied by ESPN. It also provides some local college-sports coverage, including play-by-play of Villanova’s men’s basketball games. But Johnson has an interesting idea for the station going forward. “I was happy when I came in to see that Beasley has maintained the sports image of that frequency,” he said. During his time at New Jersey 101.5, Johnson had an open field, with virtually no competition for his Garden State-centric format. So, is he ready to go toe-to-toe with so formidable an opponent as WIP? “You work hard enough, that weight's gonna start falling off. And when it does, you start feeling better than you ever have in your life. “It's sort of like you've been reborn in a way. I kind of equate that with how I feel about my career at this point."